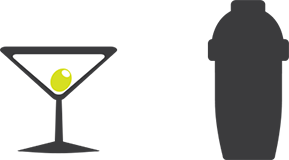 The Till Z Report on your KOBAS EPoS can be generated at any time by clicking the Admin button and then selecting Full Z Report. As the Z report marks the close of a session, this is typically used when cashing up and its purpose is to give you an overview of your sales and takings. A Till Z Report consists of a number of individual lines, each of which is explained below this demonstration report. The top part of the report deals with your totals, sales and refunds. 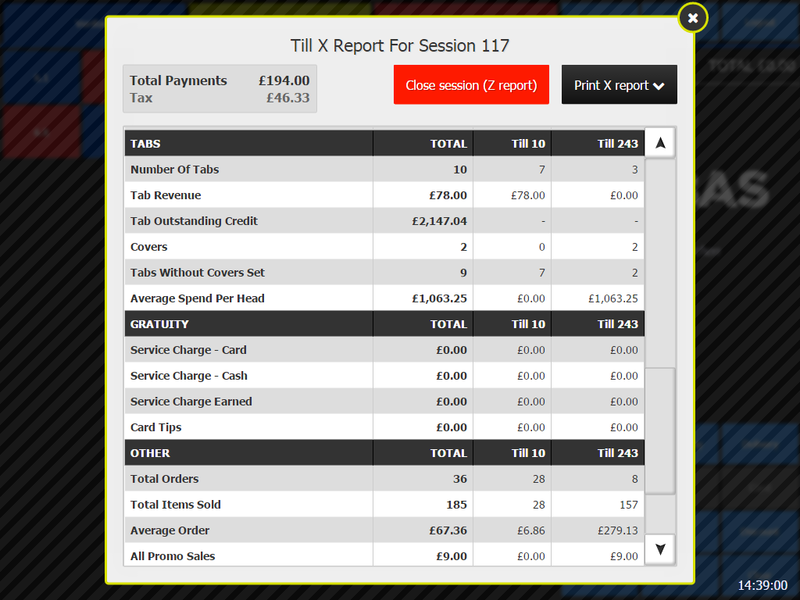 Till Z is the sum of all payments received in a session, calculated as (Total Cash + Total Cards + Total Service Charge + Card Tips) – Total Refunds – Total Fixed Discounts. This is the value you’re looking to match at the end of the session. There are plenty of reasons why your Till Z figure might differ from your total sales. The Till Z is the ultimate sum of all payments you’ve received in a session, whereas the total sales is the sum of all the items you have notionally sold. So if you have tabs that are open over a number sessions or have given refunds for items that occurred on previous days your Till Z number may be higher or lower than your Total Sales figure. Gratuities (both service charges and card tips) add to your Till Z, but not your total sales. The Tax figure is calculated from the Total Payments figure, but may also include tax incurred by a historic pre-payment (as tax is due on the sale value when pre-paid for). The Tax figure is calculated from payments rather than sales, as items sold in a previous session, but paid for in the current one, will contribute to the figure. 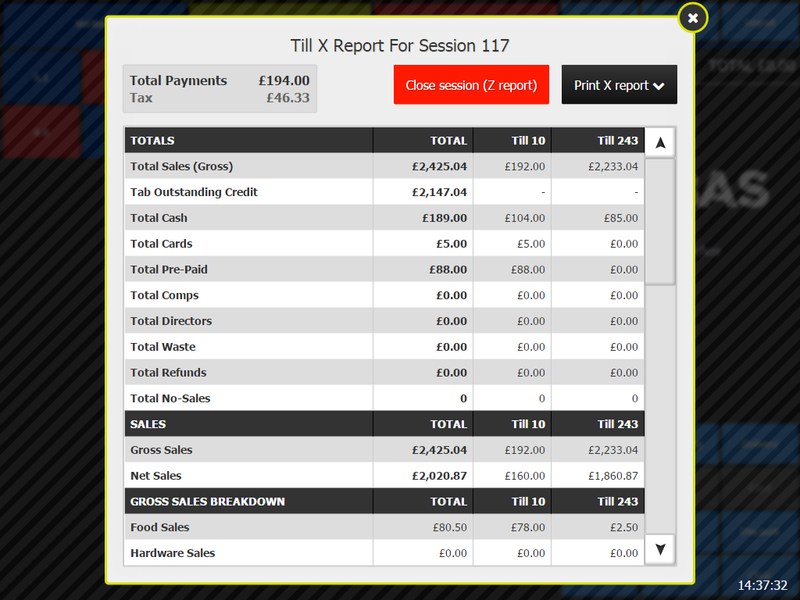 Total Sales is the amount of all the items you’ve sold in this session minus Total Refunds and Total Fixed Discounts. If doesn’t matter if everything is paid for today, this is purely a measure of the trade you’ve done. It’s worth noting that the value of items added to tabs in a previous session but closed in your current session will not show here. Tab Outstanding Credit is the total of all items sold and added to tabs where the tab is yet to be paid off. Total Cash is the totals of all payments taken in cash. This will include Serivce Charges. Total Cards is the totals of all payments taken using any card. This will include Services Charges and Tips. Total Pre-Paid is the amount of payment taken in the form of a pre-paid discount. These payments include tax at the standard rate. Total Waste, Total Refunds, Total Comps and Total Directors each show the total of all items ‘sold’ via these special order types. Total No-Sales gives the number of times the no-sale function was used to open the till during the session. Gross Sales is the gross total of sales in this session. Net Sales is the total of sales after tax has been deducted. Food Sales, Wet Sales etc show the break down of Total Sales based on the category assigned to each item sold. If you have other categories such as Door Entry, Cloakroom or Tobacco etc, they will show as extra lines in this section. Total Refunds is the same as shown in the Totals section. Food Refunds, Wet Refunds etc show the break down of Total Refunds based on the category assigned to each item refunded. If you have other categories such as Door Entry, Cloakroom or Tobacco etc, they will show as extra lines in this section. Number of Tabs shows the number of tabs that have been created. If a tab was created on a previous day, it will not be reflected in this number, even though you may have added orders to it. Tab Revenue is sum of the all payments (including part-payments) taken for tabs in this session. Tabs Outstanding Credit is the same as in the Totals section. Covers is the number of people assigned to the tabs created this session. If you have tabs open from previous sessions they will not be included in this figure. Service Charge – Card is the amount of service charge added to tabs that have been paid off this session using a card only. Service Charge – Cash is the amount of service charge added to tabs that have been paid off this session using either cash only or a mixture of cash & cards. Card Tips is the total of all over payments maybe to tabs via a card. Note – KOBAS assumes that all tab cash overpayments are change. If this is subsequently left as a tip, or indeed a different amount is left, there is no provision for recording this at present. From time to time we’re asked to report on something specific for one of our customers. Sometimes this is just shown for them, other times we think it has a value so make it available to everyone. For that reason your Till Z Report may not show all the items listed here, or may have others that aren’t. Total Orders is the amount of orders placed today. This includes orders added to tabs that are still open at the end of the session. Total Items Sold is the number of items on all orders placed today. This includes items added to tabs that are still open at the end of the session. Average Order is the mean value derived from the total of all orders placed this session, divided by the number of orders placed. All Promo Sales is the total of all items sold that have a promotion applied to them. This could be £10 off, 3 for 2, 15% off food or X + Y for £8 etc. Orders added to tabs that are not settled still show here. Total Fixed Discounts is the amount of payment taken in the form of Fixed Discounts. That means it’s discounts like £10 off rather than 25% off or 3 for 2 etc. 10pm & Midnight Sales are the total of items sold this session up to this time. Items on orders added to tabs that are not settled still show here. Price Adjustments Up & Down shows how much manual price adjustment has been done on the till during this session. Using the button at the top of the Till Z screen you can print out your Till Z Report for each individual till or all tills combined.